The story of Saint Valentine and how the legend began. 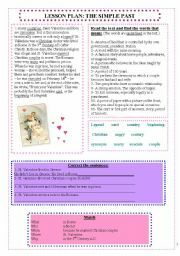 To practice vocabulary related to love and St.Valentine´s day as well as to practice the simple past with questions and reading comprehension. My students really liked it. 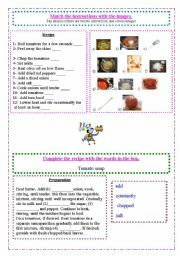 These are two activities to practice food vocabulary in recipes. I´ve created the first activity based on the musical video Revolution 909 by Daft Punk. At the end of the video they show a lady preparing the recipe. You can use with or without the video of course. I hope you find it useful. This is a beautiful song by Paul Mc Cartney. The students have to listen and complete with personal pronouns, object pronouns or possessive adjectives. Enjoy! 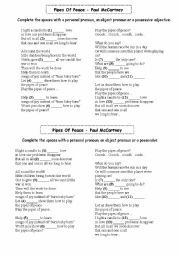 This is the second worksheet with activities to practice the form and uses the present continuous in the positive, negative and questions. 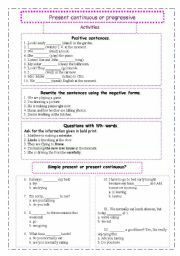 Also a multiple choice activity to choose between the present simple and the present continuous forms. Enjoy! It is a mock test practice. 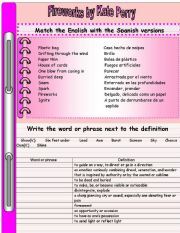 For students to practise the use of the verbs in daily routines using either simple present o simple past. Also, to practice simple past and making questions. Teachers, these are some activities to practice likes and dislikes with vocabulary related to movies/films, music and T.V. programs. I hope you find it useful. 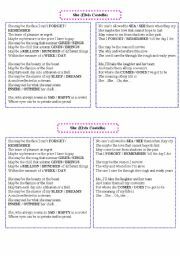 A worksheet to work with the vocabulary of the song Fireworks by Kate Perry. This is the song She by Elvis Costello with a listening activity. This song is suitable for elementary students since the singer sings slowly. 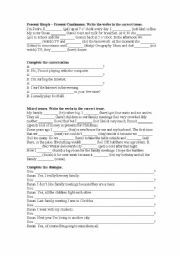 Here there are two worsheets this first one is about the positive, negative and interrogative forms of the present continuous. Then all the possible uses (functions) with the corresponding examples. 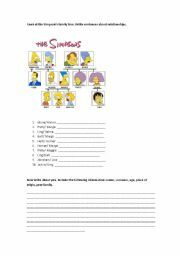 This is a good practice to introduce and practice vocabulary related to family members and relatives because everybody knows The Simpson family. It is also useful to teach and practice possesives.